There are so many jacket styles out there, so whether you prefer something super cozy (for example, a shearling coat) or something with grungy rocker vibes (leather jackets, we're talking about you), you'll have no problem finding an outerwear pick that offers up the feeling that you want to work into your look. But there's one other style to add into your rotation this season, and it's one you might not own yet. We're talking about a bomber jacket, particularly one designed in the ever-versatile shade of black. Like a leather jacket, a bomber jacket is oh so cool, though it's slightly sportier and might even be easier to wear. Intrigued? Ahead, we've rounded up some of our all-time favorite black bomber jacket outfits for winter, all of which demonstrate just how wide-ranging the styling options are. You can wear the outerwear staple with everything, from a classic pair of jeans to a sweaterdress to wide-leg trousers. Now, read on to see the looks; then shop our edit of the best black bomber jackets on the market right now. Style light-wash jeans with a black bomber. Pair a sporty bomber with high-waisted trousers and a white tee. How cool does the black bomber jacket look with this knit skirt–and-sweater combo? An easy two-piece look this winter? A midi sweaterdress and black bomber. Go for an oversize black bomber jacket for a cool, relaxed look. Proof that a bomber jacket can be chic. Pair your black bomber jacket with a bright red sweater. Try a black bomber with leather sleeves. Track pants are always a great choice. Go for a cool layered look by wearing a button-down with a sweater and a black bomber jacket. This one's equipped with lightweight insulation—perfect for the winter. Wear with jeans and sneakers. Pair this one with matching track pants. Cozy shearling makes everything better. 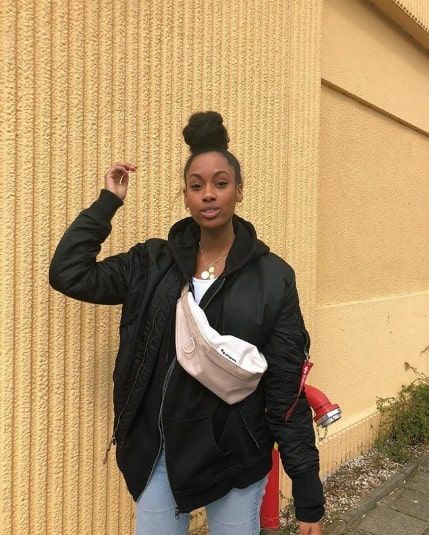 Next up, check out more bomber jackets outfits to copy.